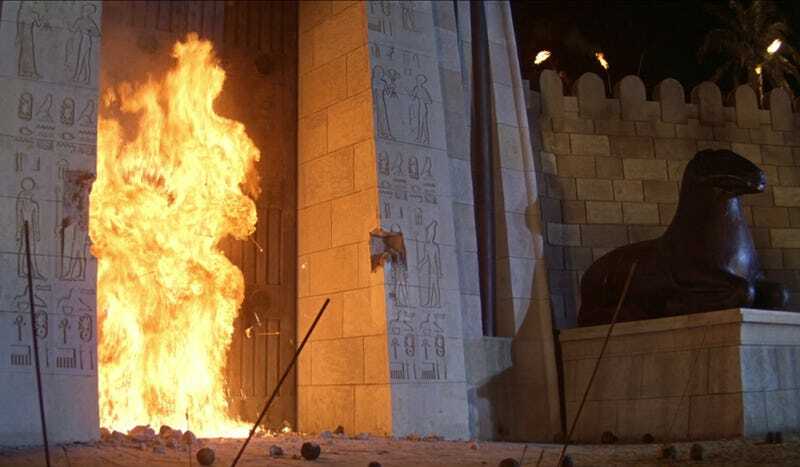 One of the great tragedies of ancient history, memorialized in myths and Hollywood film, is the burning of the great library at Alexandria. But the reality of the Library's end was actually a lot less pyrotechnic than that. A major cause of the Library's ruin was government budget cuts. Alexandria was a Hellenistic city founded in Egypt by Alexander the Great's invading forces. Ptolomy II Soter, who ruled after Alexander, wanted to found a museum in the Greek style, based on Aristotle's Lyceum in Athens. He imagined that this place — called Ptolemaic Mouseion Academy — would attract great scholars from all over the world. No longer would Alexandria be a colonial backwater or just a nice vacation spot for rich Greeks. Instead, it would become a great city of wealth and learning. And so, in 283 BCE, the great library at Alexandria was born. Over decades, its librarians and scholars packed it with hundreds of thousands of scrolls. Academics from all over the Mediterranean and Middle East came to give lectures there, and to consult its texts. At one point, over 100 scholars lived there full time, supported by state stipends that helped them maintain the scrolls, translate and copy them, and conduct research. As time went on, the city opened another branch of the library at the Temple of Serapis — this was often called the "daughter library." Unlike the many private libraries that existed in the palaces of the wealthy in the ancient world, the library at Alexandria was open to anyone who could prove themselves a worthy scholar. In principle, it was far more democratic than most other learning institutions. The royal Mouseion library and its Serapis branch were so famous for their bounty that it seemed impossible that they could last very long. Indeed, within a couple hundred years of its founding, we hear that Julius Caesar burned the library down in an attack on the city and Egypt's ruler Cleopatra in 40 CE. But there is little evidence that either the library or its daughter branch were wrecked; some scholars believe that references to "40,000 lost scrolls" in the historical literature refer to warehouses full of scrolls for export that Caesar burned when he sacked the port. There are other reports of burnings and sackings as well. Supposedly the library was destroyed by Emperor Aurelian in a battle against Queen Zenobia in 272 CE. It's very likely that this battle left its scars on the part of the city where the library was housed, but still there is no evidence that the structure was lost. Religious riots in 391 and 415 also damaged the library, but it was rebuilt and its collections restored afterward. Though it seems fitting that the destruction of so mythic an institution as the Great Library of Alexandria must have required some cataclysmic event . . . in reality, the fortunes of the Great Library waxed and waned with those of Alexandria itself. Much of its downfall was gradual, often bureaucratic, and by comparison to our cultural imaginings, somewhat petty. For example, the Roman Emperor Marcus Aurelius Antoninus suspended the revenues of the Mouseion, abolishing the members’ stipends and expelling all foreign scholars. Alexandria was also the site of numerous persecutions and military actions, which, though few were reported to have done any great harm to the Mouseion or the Serapeum, could not help but have damaged them. At the very least, what institution could hope to attract and keep scholars of the first eminence when its city was continually the site of battle and strife? What's interesting here is Phillips' emphasis on how the decline of the library rested as much on its reputation as a learning center as it did on the number of books in its collection. What made the Museum and its daughter branch great were its scholars. And when the Emperor abolished their stipends, and forbade foreign scholars from coming to the library, he effectively shut down operations. Those scrolls and books were nothing without people to care for them, study them, and share what they learned far and wide. The last historical references to the library's contents meeting their final end come in stories about the events of 639 CE, when Arab troops under the rule of Caliph Omar conquered Alexandria. The Serapeum had been destroyed in the attack on the pagan temples in 391. The last famous figure associated with the Museum had been Theon, father of the celebrated Hypatia who studied geometry and musicology and whom the Christians, convinced in their ignorance that she was a heretic, barbarously murdered in 415 . . . Naturally, the city's books had changed, too; and not only in their content. The delicate scrolls of old had gone. Their last remnants had been cast out as refuse or buried in the sand, and they had been replaced by more substantial parchment, elegantly made and bound into thick codices - and crawling with errors, for Greek was increasingly a forgotten language. The texts now consisted chiefly of patristic writings, Acts of Councils, and 'sacred literature' in general. This was not Ptolemy's great collection, nor was it the center of scholarship in what was then the modern world. It was a broken-down remnant of its former self, neglected for centuries. The collection was mostly stocked with materials that reflected what Judeo-Christian bureaucrats would have considered important; these materials did not reflect the Greek ideal of universal knowledge that had birthed the library in the first place. Obedient to the Caliph's orders, [Amrou] set about his task of destruction. The books were distributed to the public baths of Alexandria, where they were used to feed the stoves which kept the baths so comfortably warm. Ibn al-Kifti writes that 'the number of baths was well known, but I have forgotten it' (we have Eutychius's word that there were in fact four thousand). 'They say', continues Ibn al-Kifti, 'that it took six months to burn all that mass of material.' Aristotle's books were the only ones spared. Though we imagine that knowledge and civilizations are destroyed in one fell stroke, a rain of fire as it were, the truth is a lot more ugly and more slow. The ancient world's greatest library didn't die in battle — it died from thousands of little cuts, over centuries, that reduced this great institution of knowledge to a shadow of its former self.